Pilates complements physiotherapy excellently, it teaches the client how to move properly, be aware of their body and improve their posture, control, strength and flexibility. It can be very useful in the treatment of lower back pain but is a great form of exercise that anyone can do! The aim of our Pilates Classes is to educate you on how to retrain your body for efficient movement, rather than just provide an exercise class. We have several instructors, each brings their own particular skills and personality into the way they teach, so feel free to come along and try them all! Because many of our instructors have backgrounds as Physio’s, we can offer Clinical Pilates. 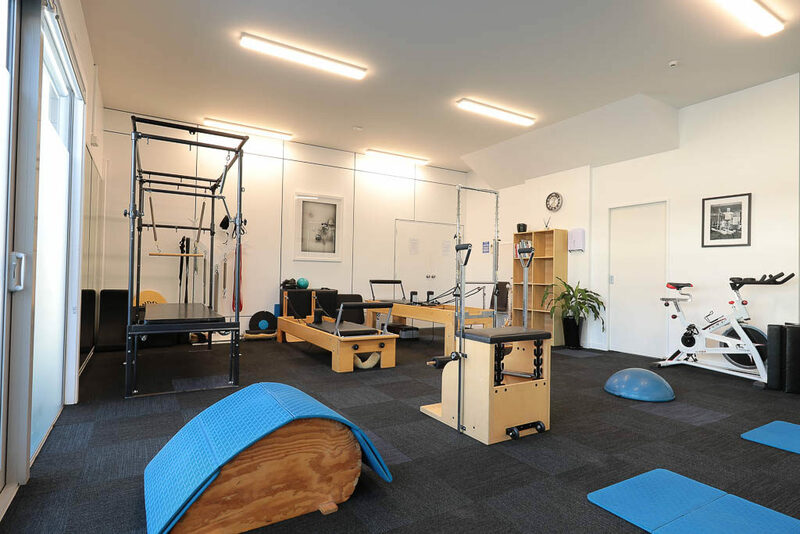 Clinical Pilates is based on clinical research, and is specifically designed for those rehabilitating from injury. This wealth of knowledge is shared amongst the whole team. In addition all instructors undertake professional development outside of the studio. In Mat Pilates classes you will work in a group of up to 8 people and the instructor will take you through an entire body work-out. In general everyone is working on the same exercise simultaneously, although your instructor will be able to make modifications to the exercises to account for your ability level. This is possible because class numbers are relatively small. Mat Pilates classes generally run in a 6 week blocks, however casual attendance is possible depending on availability. Please inquire at reception for details on current classes. In Studio Pilates classes you will be given your own personalised programme with a maximum of three other people. You will be closely supervised by your instructor who will not only tailor your programme to your individual needs, but also progressively challenge you further to meet your goals. 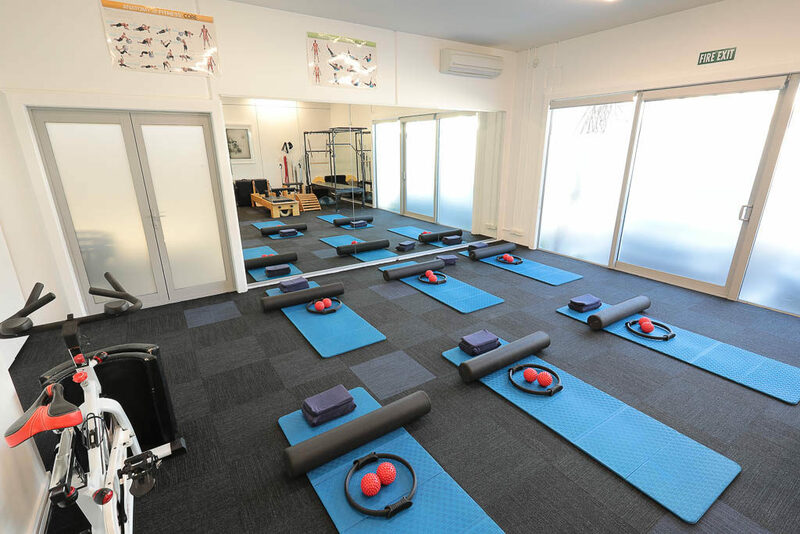 You will have access to specialised Pilates equipment; trapeze table, reformers, tower, arcs and combo chair, along with all of the smaller equipment. Studio Pilates classes are suitable for most clients due to the high level of supervision and variation. They are ideal for people recovering from an injury. The Studio membership allows increased access to the Pilates equipment. This is so that clients who have a good understanding of Pilates can work independently. The membership suits people that have been a studio client for some time. The membership is great value for money as clients are able to access the studio several times a week during opening hours. Clients are required to book their time as there is a maximum of 4 clients in a studio at a time unsupervised. Sessions are from 30-60minutes in duration. A client will start with a one on one session with an instructor where a detailed history is taken, goals are discussed and a programme is designed to meet the clients needs. The clients programme will be printed out with pictures and descriptions of the exercises with the appropriate springs and number of repetitions. After the instructor is happy that the client is able to perform the exercises safely and effectively then they will be able to come into the studio at their booked time and complete their exercises. Conditions apply – please contact the studio for more information and details. Doing ‘Mummy Me Time’ Pilates has helped my posture (which was terrible!). Now I remember to drop my shoulders when I push the pushchair or sit at my desk. Being shown the muscle activity by a physiotherapist and then coming to Pilates has really helped (my back) no end- I couldn’t have believed it.